Transportation and Intelligence Minister at Arutz Sheva conference: PA must choose between axis of evil and axis of friendship. Transportation and Intelligence Minister Yisrael Katz (Likud) responded on Monday to the Trump administration’s proposed peace plan, as reported on the weekend by Hahadashot (formerly Channel 2 News). 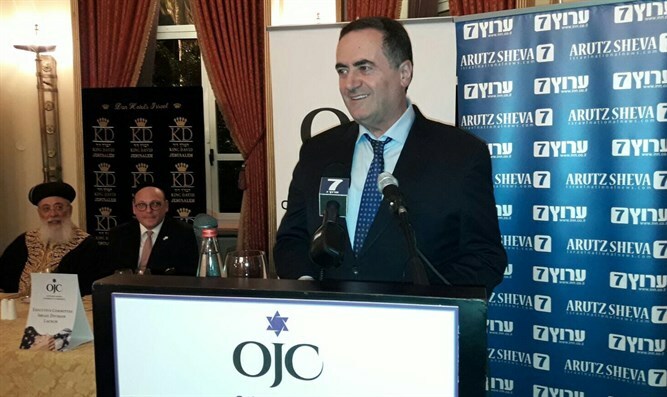 Katz spoke at a conference hosted by Arutz Sheva and the Orthodox Jewish Chamber of Commerce held at the King David Hotel in Jerusalem. “Less than a year ago, the United States chose not to veto an anti-Israeli resolution against the settlement enterprise in Judea and Samaria, and two days ago the U.S. administration, headed by President Trump, warned the Palestinians that it would close their embassy if they continued to act against Israel. The smiles on the Palestinians’ faces from a year ago have been erased,” recalled Katz. "It’s not a coincidence. President Trump sees and divides the world clearly into two main axes: the axis of evil, headed by Iran and North Korea, and the axis of friendship led by the United States, which includes its pragmatic Sunni allies and of course, Israel. The Palestinian leadership must decide whether it chooses to be part of the axis of evil or to join the axis of friendship," he stressed. Katz noted that the Trump administration makes it clear today that any Palestinian government must comply with the conditions of the Quartet, commit to non-violence, recognize Israel and honor previous commitments and agreements, including dismantling the weapons of terrorist elements.